Inspired by activist consumers, farmers are growing ideas that could change the world. Nutrition Business Journal Editor-in-Chief Rick Polito and aronia berry farmer Andrew Pittz set off on a journey from Boulder, Colorado, to Anaheim, California, visiting farms and interviewing industry leaders and politicians along the way to explore the connection between American agriculture and the dietary supplement and functional food industries. This is part four of five. Read the rest here. Late in a season of historic rainfall on the typically fog-bound Northern California coast, the sun that greets us at Swanton Berry Farm seems disarmingly incongruous. The sun shines brighter than we expected, and colors echo that radiance. The unexpected echo is the takeaway story of Swanton Berry Farm. Just north of Santa Cruz, with only Highway One between the fields and the rhythm of the surf, Swanton Berry Farm stands as a growing monument to that one farmer with one idea we’d talked about on our drive the night before, and to the rippling echo that can follow. For founder Jim Cochran, the idea was the first organic commercial strawberry farm in California. The echo that followed was exporting regenerative practices to other farmers and mixing social justice into the yield. He tells us it’s expensive, but it’s possible. And it’s been possible since the first berries were planted in 1983. That’s what we want to hear about today—what’s possible, and how ideas, ideals and innovation echo across entire industries. Walter Robb, too, has a wealth of experience with what’s possible. The former Whole Foods Market CEO saw 25 years of remarkable growth between his first Whole Foods job in 1991 to his transition out at the end of 2016. We reach Robb on a white-knuckle spin over Highway 17 to get MegaFood's Bethany Davis to the San Jose Airport. He tells us that change like we’d seen in the strawberry fields is more urgent and immediate than ever before. The driving force is the farmer on the ground, but that farmer has partners by the millions—each of them marching down the aisles, smartphone in hand to research origin and ethics. This confluence of interest, awareness, connection and commerce is growing conscious economies. The journey from plausible to possible has never been faster, never more important, he says. “Business is the most powerful force for change in the world,” Robb tells us. We’re not sure what to expect when we pull into the gravel lot outside battered sprawl of greenhouses at Whiskey Hill Farm. We know they are growing organic turmeric. That’s impressive enough, considering the soaring demand and the sometimes questionable supply. Nearly all the turmeric sold in supplements on the U.S. market is imported—too much of it adulterated with synthetic curcuminoids. But Whiskey Hills Farm is also home to Blume Distillation, a biofuels operation. We are in Watsonville, at the southern fringe of the Bay Area, and I’d pictured a greasy tank of biodiesel and the digestive stench of food waste. But we walk in and see rocket science. It’s not an actual rocket. It’s an alcohol still shaped like a rocket. But it’s actual science. And David Blume is the actual scientist, a man who has taken a passion for turning food waste into fuel and made it into a holistic closed system of horticulture and fuel production that scoops up every outflow of energy or material and routes it back into the system to build more energy, more material. The effluent from the food waste left over from the distilling process goes into a methane digester built from pipe and pond liner for a cost Blume estimates at $2,500. The methane is then burned to provide the heat that is the essential energy input in a distillery. The CO2 from the burned methane is piped into the ground in the greenhouses where it feeds the turmeric and the photosynthesis process. The wastewater from the methane digester is processed through a series of ponds. The algae in the ponds pulls the nitrogen out of the water and purifies it, and then becomes fertilizer for the turmeric and other plants in the greenhouses. 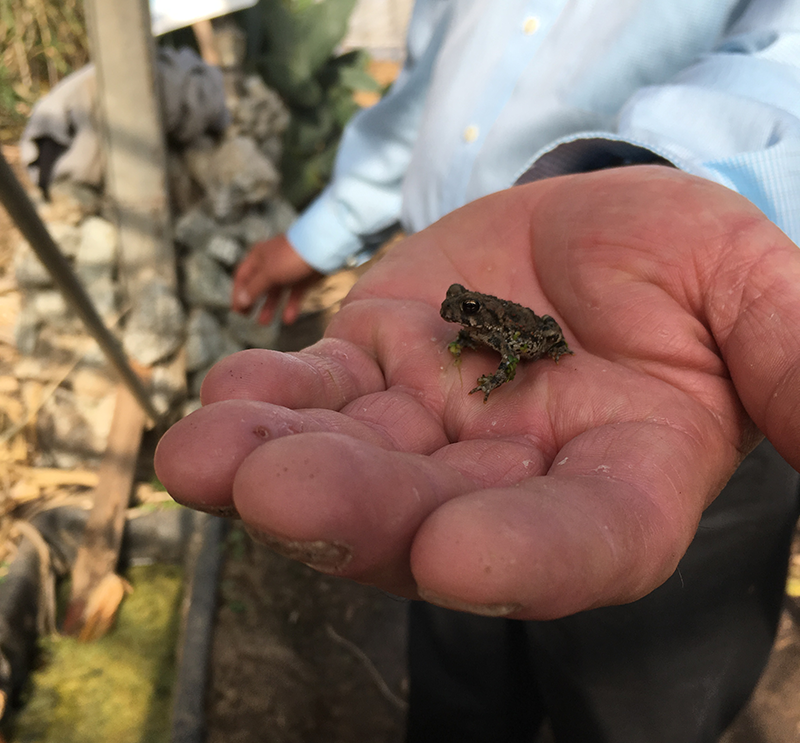 The last of the ponds provides homes for small frogs that provide the night crew in the Whiskey Hill pest control operation. Lizards patrol the greenhouses during the day. Both crews digest the millions of bugs and their droppings become more fertilizer. Greenhouses in the coastal fog belt require heat. They also generate compost by the ton. At Whiskey Hill Farm, water pipes running through the mounds of compost picking up the heat generated by the decomposing material. Every night the mounds are "turned" by high-pressure blasts of CO2 from the distillery. The product might be lab-grade alcohol and organic turmeric that sells faster than the CO2-charged greenhouses can grow it, but the value proposition is in the trial and error, tinker and tweak Blume designed into the system. Blume has worked with NASA. Buckminster Fuller called him for ideas (and wrote the forward for Blume’s book). He wants to see smaller refineries scaled up from his technology make sense of biofuel in a way that the Big Ag corn ethanol processing industry doesn’t. He wants to grow organic turmeric, but he also wants to grow ideas that could change farming, change fuel production, change the world. Andrew is having a one-degree-of-separation fanboy moment. His hero is Buckminster Fuller. The license plate on Andrew’s Ford Focus, the set of wheels we’ve lived in since leaving Boulder three days earlier, is “TRIMTAB,” referring to the smaller fin on the end of a larger rudder that helps steer massive ships. The trim tab was a central metaphor in Fuller’s philosophy of designing change. Andrew just met a farmer who knew Fuller, who wants to create opportunities for farmers in environmentally conscious way that’s plug-in ready for the natural products and dietary supplement industries. Andrew is a kinetic bolt of energy in his calmer moments. He’s fusion reactor arc of blinding excitement in this moment. Of course, Blume’s closed loop system isn’t entirely closed. 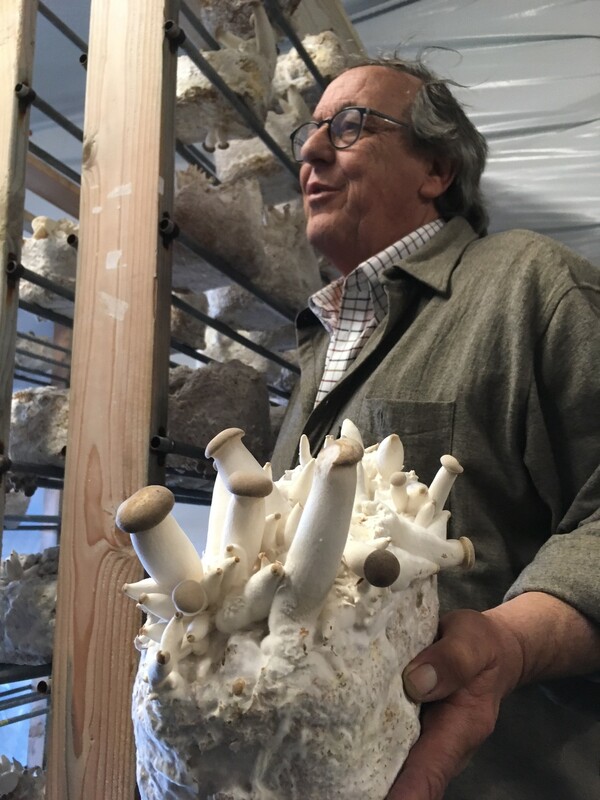 In addition to the food waste from the processing plants in Salinas, he uses blocks of wood pulp left over from an organic mushroom farm in Moss Landing a few miles away. The fungus eats through the blocks, and when the block is used up, Blume adds it to the compost piles. We are on our way to the mushroom farm when we leave Whiskey Hill Farms. It’s a short drive into a long story. John Garrone didn’t start his mycological adventures as a mushroom farmer. He began as a mushroom lover, fascinated by the fungi and their properties, both culinary and medicinal. When he found he had a talent for growing them, he began a business in a warehouse in San Francisco, When he found he had a talent for selling them, he moved to the larger operation of Far West Fungi, a collection of buildings and shipping containers south of Watsonville and not far from the Elkhorn Slough where the Carneros River greets the Pacific in a vast estuary. Whatever fascination drew Garrone to mushrooms has not faded with the decades. This is a family operation, and it seems at times on our tour that fungus is part of the family. He heaves open the shipping container doors to reveal tree oyster, lion’s mane, maitake and a dozen other species, each with its own ornate structures and colors, each with its own particular properties. He has a palpable affection for them, and he can list off the medicinal qualities of each—qualities explained on the company website. But he knows that the vast bulk of the mushrooms the Garrone family raises will end up in cooking pots, not healing teas or formulas. He is aware that there are supplement companies selling medicinal mushroom products, but those companies aren’t approaching him. Days later, I will see several brands and a number of products based in mushroom medicine, but the supply chain is traced to China every time. “The strength of my business is I’m not from China,” he tells us. Garrone is growing organic mushrooms with unquestionable family-farm transparency. He could grow the business and create more jobs, more opportunities, more confidence for consumers, if the supplement and functional food companies bought those mushrooms. But the phone doesn’t ring. You can find Garrone’s mushrooms at the farmers market at the San Francisco ferry building. You can’t find them in the supplement aisle. Five minutes in the car and only a slight rise of dunes separates us from the beach. At this hour, the shore sprawls almost deserted, and the sun lets loose the best light of the day. The high tide wipes the slate clean, and our footprints are already gone when we turn to walk back to Andrew’s car. At the beach, every day is a fresh canvas for new footsteps and new castles in the sand. Every day is a do-over. 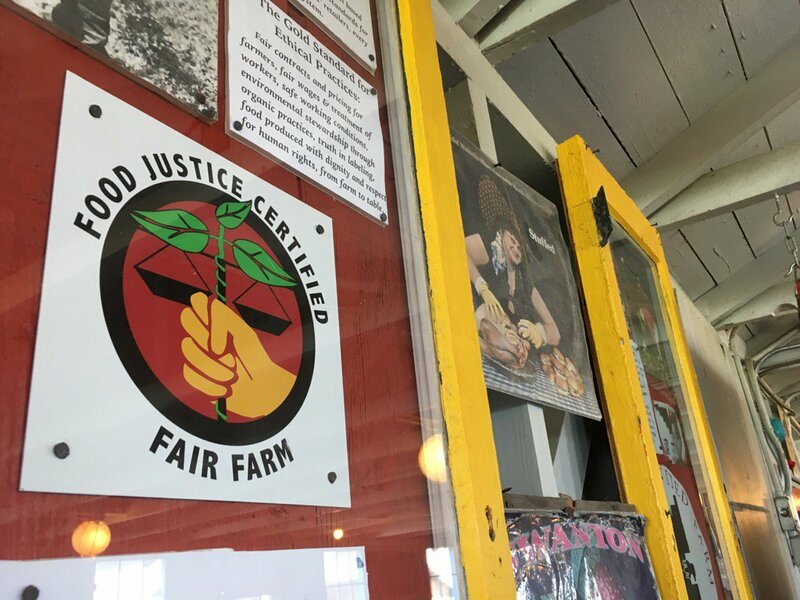 In natural products, some ideas disappear with tides and trends, and some, like agricultural justice or biofuels, find an echo that resonates across decades. But every day is a day for a new idea, a new ideal, a new echo.